Additional research provided by Douglas J. McMillan and Shannon L. Reavis. See also: Brown Mountain Lights; Conjure; Devil's Horse's Hoofprints; Devil's Tramping Ground; Folk Music; Ghosts; Maco Light; Madstones; Root Doctors; Southern Folklife Collection; Wampus. In North Carolina, a state that puts great emphasis on oral traditions and family customs, the value of folklore and folktales is impossible to overstate. As the collected narrative culture of a group of people through many generations, North Carolina folklore is remarkably complex, representing a huge array of different narrative, traditional, and cultural styles. It may encompass such disparate forms as Cherokee legends, ballad singing among residents of a remote mountain valley, family ghost stories, religious messages on truck dashboards, or even modern-day jokes transmitted on the Internet. Folklore, unlike other cultural forms, usually circulates among members of a group or community in informal ways often not involving printing or other forms of recording. This informality emphasizes the importance of interpersonal relationships within the community, a key to the importance of folklore in creating and maintaining group identity. Sometimes seen as involving only "old-time" customs or stories, folklore is also the constant cultural interplay in the melting-pot environment of modern North Carolina, continuing to produce new folktales and folk customs that will exist for decades to come. 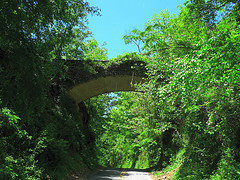 "Helen's Bridge, supposedly haunted, on the crest of Beaucatcher Mountain." Image courtesy of Flickr user Richard Butner. Available from http://www.flickr.com/photos/giantsloth/3547418868/ (accessed May 29, 2012). 1 January 2006 | Baker, Bruce E.; McFee, Philip; McMillan, Douglas J.; Reavis, Shannon L.